This is a bottle of 1972 Willamette Valley Pinot Noir, the first vintage from Erath Vineyards. 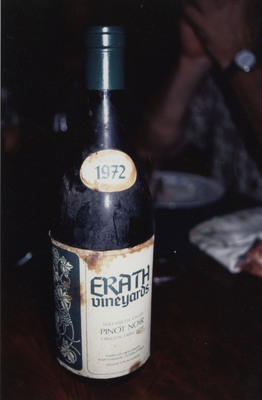 Unknown, "Erath Vineyards 1972 Pinot Noir - First Vintage" (1967). Erath Winery Photos. Image. Submission 93. This is a scan taken of the back of the photograph.